Born in 1943 in Helsinki. Studied at the Institute of Industrial Arts 1961-66, where she worked as a teacher alongside doing her own artistic work up to 1980. Married to sculptor Tapio Junno. Works first shown in 1967 in Helsinki and in solo exhibitions from 1969 on, including at Galleria Katariina, 1972 and at Galleria Sculptor, 1991. Most recent extensive solo exhibition at Forum Box in Helsinki in 2003. Took part in exhibitions of Finnish art abroad in the 1970s and 80s. Represented in various museum, municipal and state collections. Artists' Association of Finland prize, 1982. Editor-in-chief Taide (Art) magazine 1980-84. Public works include: Pochard Landing, 1987, at the Ministry of the Environment, Helsinki; The Wagtail's Spring Step in Södertälje, Sweden; Flock of Geese, 2000, at Lintulahti Square, Sörnäinen, Helsinki; and Past Times, 2000, in Brussels, Belgium. Pirkko Nukari's sculptures are like subtly delineated nature lyricism. Nukari makes precise observations in nature – on the landscape, animals and plants. The titles of the works, such as Past Summer or On the Shore, focus attention on lived fleeting moments. The sculptures condense into poetic images of Finnish nature. As a depictor of flora and fauna, Nukari is in her element in the world of birds. Hailuoto island off Oulu and its old elementary school for a long time provided a place for observing migratory birds. The brisk airiness of the watercolour works of Nukari's early years is also continued in sculptures modelled out of clay. Throughout her career she has been able to preserve in her works an agreeable interpretative lightness. The importance of nature values emerges as a counterweight. In Nukari's works attention is focussed on the representation of temporality. Time passes with the fragility of their themes: between the blink-of-an-eye duration of a bird's step and, on the other hand, of the way chosen to make them, the temporality of the sculptures cast in bronze that embraces eternity. She herself has said: “All beings are compounds of the same life.” The nature romanticism of her works emphasises the cycle of nature – the eternal round of birth and death. The scant elements in the sculptures conceal the story's offshoots. Nukari's Lost Pygmy Owl, 1985, looks like a riddle. 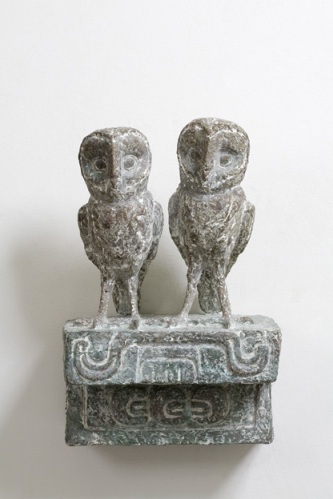 The owl sits on a block of stone that appear as though still waiting for its sculptor. On the other hand, the theme can be interpreted as a Finnish national version of an ancient tomb sarcophagus guarded over by a bird. Nukari's works pass from recording details such as lilies-of-the-valley to observing events in nature. In them nature constructs its own architecture. The sculptures grow from sketch drawings into monuments that put nature's minor miracles on a pedestal in place of power and strength. Nukari raises them to the light as they are when they are given in quiet experience and in the privacy of observation in a nature awakening after the winter.